Indie Studio Hammerware has released Goodfolks, sequel to the popular Linux game Family Farm. 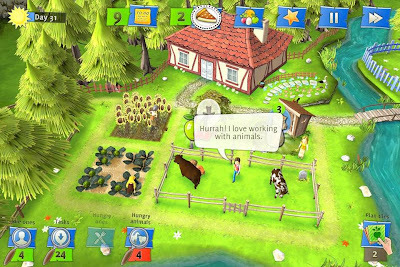 The game is a simple but realistic-looking simulation of life in the country. Goodfolks are coming to this country looking for a nice place to live and work. You are going to build fields, orchards, and livestock corrals and help them organize their work. You can have various farm animals producing eggs, milk, wool, and manure. Restore the village and its surroundings and collect all the animal breeds. I remember Family Farm being one of the first commercial games to be released in Ubuntu Software Center and it has been highly rated by Ubuntu users. Hammerware also published some data about Family Farm sales and they were happy that ROI on Linux port was positive for them. In fact, Linux port was second in terms of revenue for them, beating Mac. You can get the game for $10 from here (Intel cards are not supported).